Item2008.3.3.3.1 - View of Geoffrey R. Weller Library from University Way, Prince George, B.C. 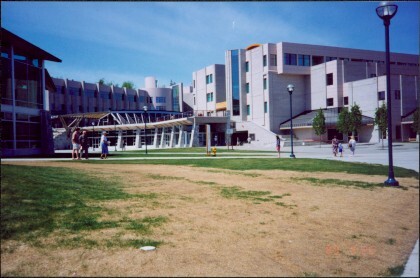 Photograph depicts the Agora center at the University of Northern British Columbia in Prince George, B.C. Library building can be seen in right background, cafeteria building on far left. Unidentified individuals can be seen walking on campus. Accompanying note from Maureen Faulkner: "The processional gathers on the upper walkway". Photo believed to have been taken on the day Bridget Moran received an Honourary Law Degree. Stamped annotation on recto of photograph: "21+01 NAN-24AU 047".